To demonstrate this point, I would like to highlight a very special volunteer. Jane* is a 12-year-old girl who first came to Friendship Center Montecito with her class during a school-wide day of service, visiting with our community’s “grandmas and grandpas.” Jane immediately warmed to the members and spent time with Victor*, one of our participants with more advanced dementia. Jane returns regularly to visit with the seniors for about thirty minutes after school, talking about everything from what she is learning in her studies to the new rubber bands on her braces. Victor, who normally struggles to form coherent sentences, brightens and is more communicative whenever she is here. The impact of Jane’s visits is palpable–you can feel the joy radiating from each of the members. Though we do have specific volunteer opportunities at both Friendship Center sites, (listed below) we are always looking for people to come visit with our members–share life stories or chat about the day, or just sit together in compassionate silence. We also welcome volunteer visitors of all ages, and encourage volunteers with kids to bring them along! The US Census Bureau projects the nation’s population over 65 to double by 2050. As the senior population increases, so will the number of dementia diagnoses. Volunteers are an elegant solution to the need for strong community support to mitigate loneliness, one of the more devastating co-occurrences of dementia, and aging in general. So, forget your worries that you don’t have a good singing voice or you aren’t much of a chair yoga practitioner… your patience, your empathy, and a little bit of your time is all that’s needed to be a great Friendship Center volunteer. –Leading our new BrainFit class, fun memory exercises for seniors! 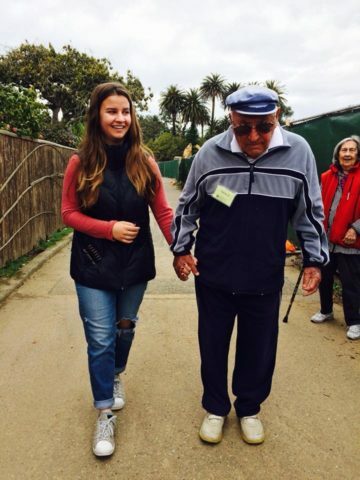 Make a senior smile and a caregiver feel comforted… sign up to volunteer today!